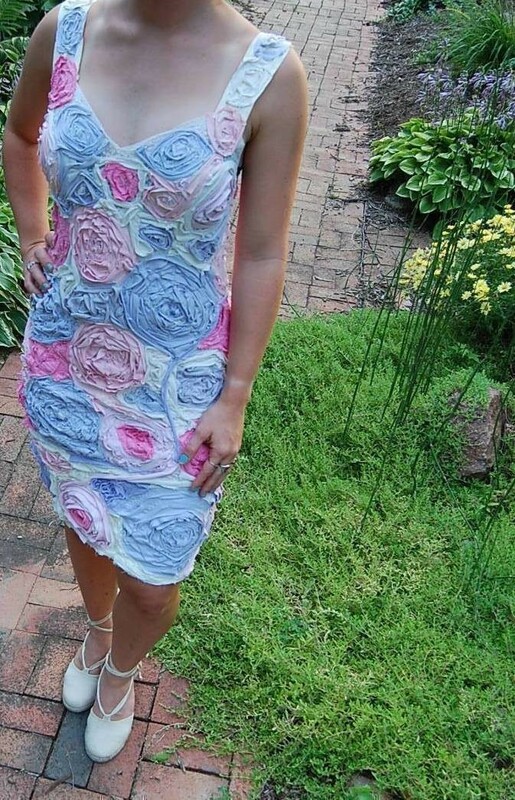 T-Shirts + sewing machine + time = This dress! 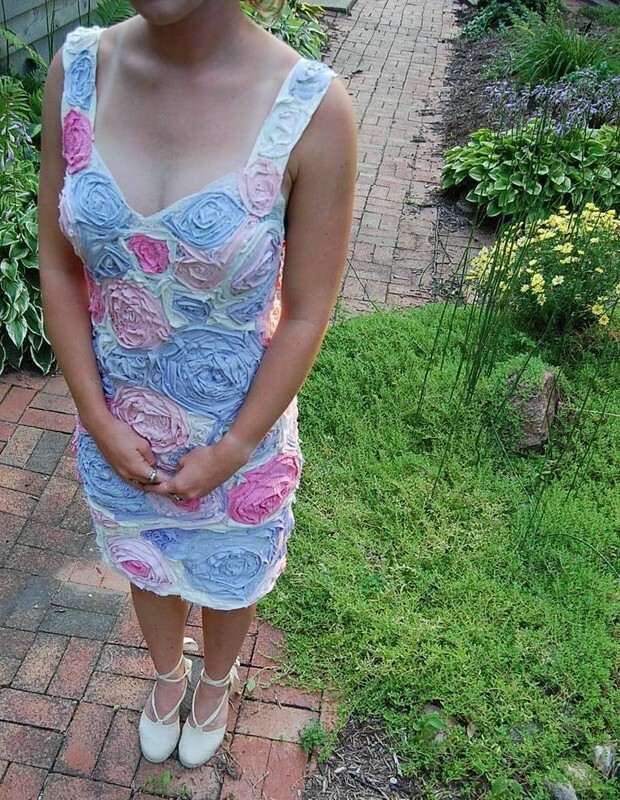 I saw online how to make a rose out of knit and I was inspired to make this dress. I did not buy any new materials, I simply used shirts I had around the house and a few from Goodwill. The t-shirts were sewn onto an old slip. 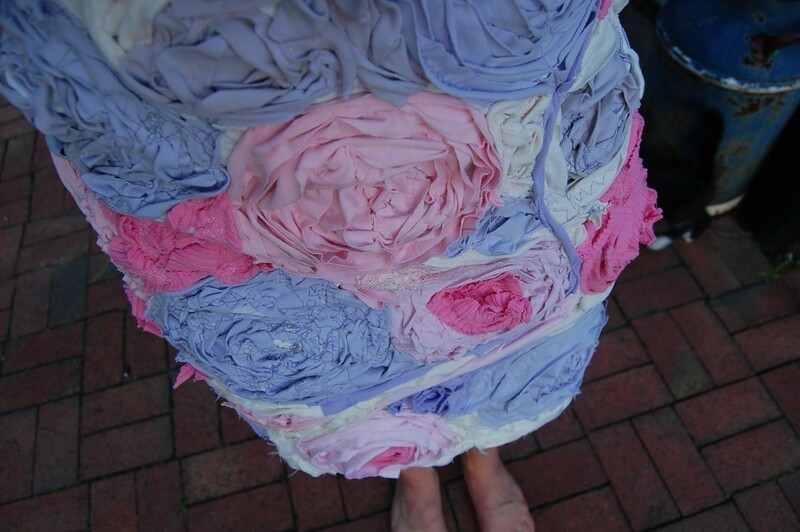 This dress is a fashion recyclable! See more DIY on my <a href="http://www.starsforstreetlights.blogspot.com">blog</a>. First you cut long strips of t-shirts. I used plain t-shirts to create a more feminine look, but I am sure if you wanted to use shirts with prints, you could have a spattering of color with more of an edge or punk feeling to the dress. 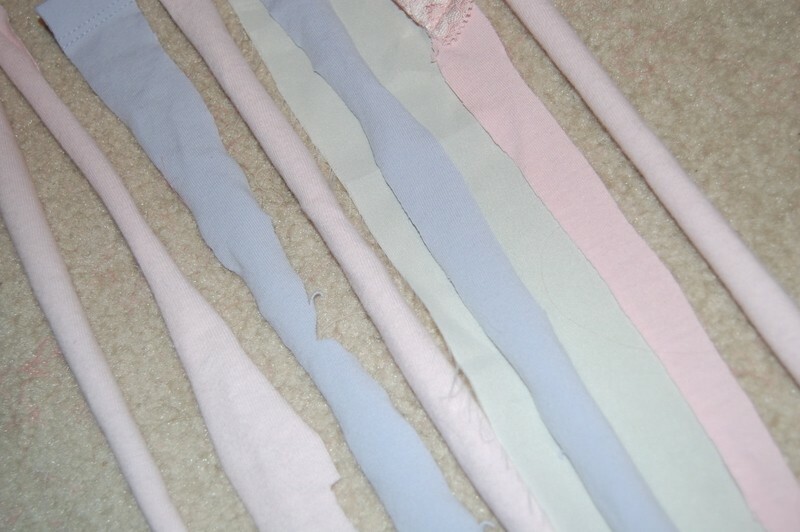 It also does not matter how exact your strips are because jersey knit just curls up upon itself. Depending on how fluffy you want your roses, that is how thick you cut the strips. 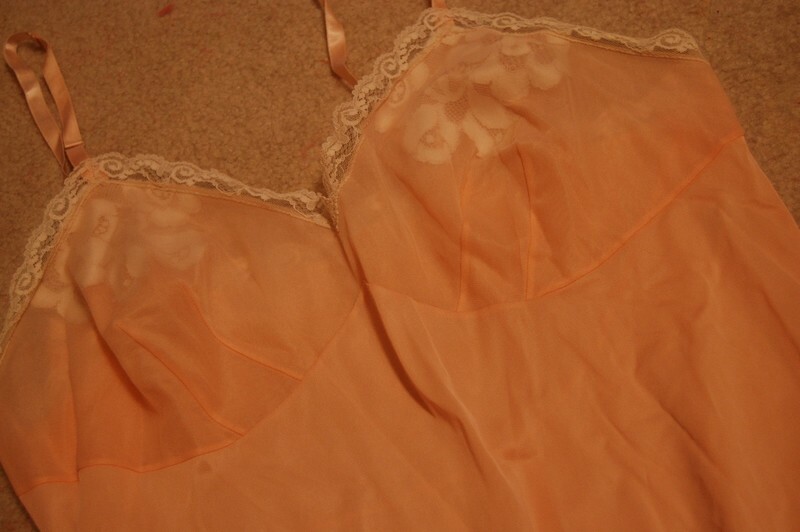 Next, you find an old slip or any dress on which you would like to sew your roses. It does not matter what the material is as long as it stretches. Because of all the sewing you will be doing to make the dress, the fabric underneath needs to be able to give a little. Tip: Make sure the dress base is long enough because it will get shorter as you go. Mine became too short as I was sewing but I simply sewed a little extension the the base dress and sewed more roses onto it. 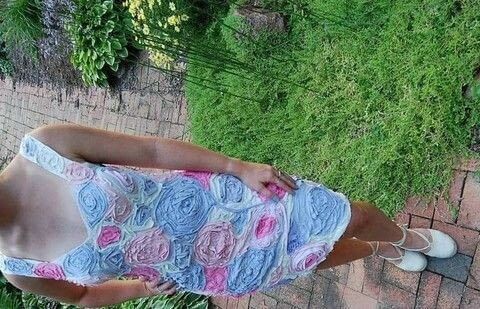 Now all you have to do is start sewing the roses onto your dress base. 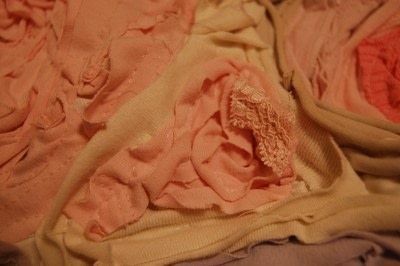 I started in the center and wrapped the strips of t-shirts around the rose as I went, turning the dress on the sewing machine periodically to make a spiral pattern. But, as you can see, my flowers look much different than this. Make it your own! I covered the entire dress with these knit roses. It is simple enough, but it is tedious. Make sure you plan out the design of the dress before you just start sewing 2 of the same color flowers right next to each other. Tip: If there are odd shapes that you need to fill in between flowers, just sew little shapes in there. It does not hinder the design of the dress whatsoever. **I also added a little lace for texture throughout the dress. After you are done, you will have a one-of-a-kind creation that your friends can scratch their heads and ask you how you did it! 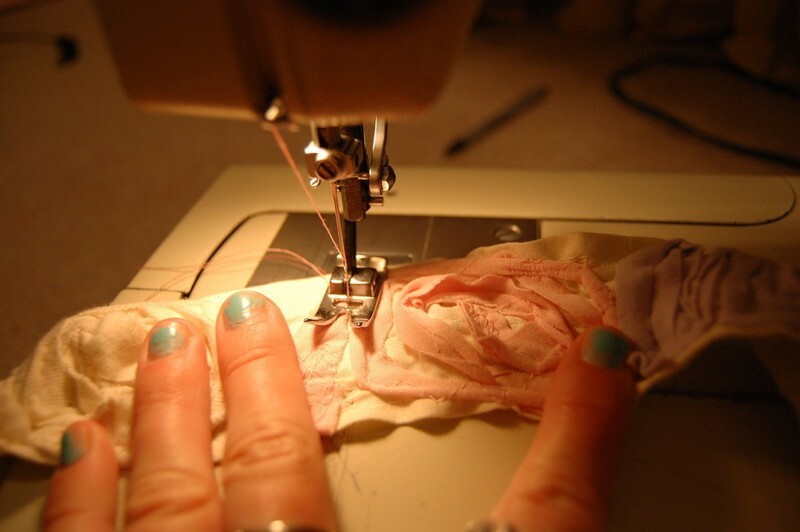 How hard do you think it would be to hand stitch them on? Thanks for the tut....this is way tooooo cute!!! LOVE YOURS!! !